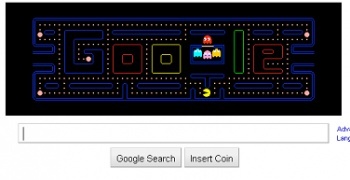 Today marks the 30th anniversary of the release of the original Pac-Man in Japan, and Google's logo has come down with a bad case of Pac-Man Fever. The lovable yellow puck that was one of gaming's first recognizable "characters" turns thirty today, and Google is getting in on the celebration ... by changing its logo. Now, I know what you're going to say: "But John, Google changes its logo to celebrate all the time!" That's absolutely true, and Google calls them "doodles". This doodle, however, is different, because it's playable. Yes, Google has created an entire 255-level clone of Pac-Man, complete with ghosts, power pellets, an "Insert Coin" button, and even a Level 256 "kill screen." This playable logo was created by Google's senior user experience designer Marcin Wichary, who first saw Pac-Man at the age of 5 while traveling with his father, whose job it was to repair arcade machines. Guys, this thing is too awesome for words. Just be careful, or else you might spend all afternoon playing this damn thing.